The long-standing assumption that gene expression in eukaryotic cells is basically controlled at the transcriptional level is now progressively substituted by a scenario of regulation also largely dependent on complex networks of signals acting on mRNAs, which shape the proteome by changing mRNA accessibility to translation. This layer of regulation, which seems to be partially independent of transcriptional networks, is the general framework of activity of the laboratory. The laboratory is especially focused on the sequence-dependent translational control exerted by RRM-type RNA binding proteins, and on their involvement in tumorigenesis and neuronal degeneration. The translatome: reconstruction of sequence-dependent translational control networks in whole transcriptomes. Structural and sequence features clustered in the 5’ and 3’ UTRs of mRNAs dictate their fate in the cytoplasm, by the recruitment of RNA-binding proteins and non-coding RNAs. By a combined in silico and experimental approach, we look at the convergence of signals dictating mRNA fate, which can allow reconstruction of the shape of post-transcriptional networks. Structure and function of the polysomal machinery. The ribonucleoprotein megacomplex governing translatome dynamics is the polysome. With the use of advanced imaging methods coupled with high-throughput and bioinformatics tools we are proposing a new model for the organization of the translational apparatus, with important functional consequences (with G. Viero's lab). Sequence-dependent derangement of translational control in cancer onset and progression. Recent findings point out to the deregulation of translational control as a leading cause of tumorigenesis. We are conducting a systematic analysis of the activity of RNA-binding proteins in cancer stem cell behaviour in the neurally derived tumor types glioblastoma multiforme. Translational determinants of tumorigenesis in neuroblastoma and identification of druggable targets. Neuroblastoma is a neural crest-derived tumor that represents the major cause of death in infants. Its pathogenesis is linked to the lack of differentiation of sympathoadrenal progenitor cells into ganglion and chromaffin cells. We focus on the role in these events of the translation of known neuroblastoma disease genes. We also look for ways to reestablish terminal differentiation or promote the selective death of these neural progenitors by small molecules. Epitranscriptome modifications in cancer. We are addressing mRNA adenine methylation and its recognition by RNA binding proteins as a way of influencing translatome dynamics and promote cancer onset and progression. Motoneuron diseases as translational diseases. We are focusing on the role of the amyotrophic lateral sclerosis causative protein TDP-43 and the spinal muscular atrophy with respiratory distress causative protein IGHMBP2 in axonal translation, to study their role in the onset and progression of these lethal conditions. Bernabo, P., Tebaldi, T., Groen, E. J., Lane, F. M., Perenthaler, E., Mattedi, F, Newbery, H.J., Zhou, H., Zuccotti, P., Potrich, V., Shorrock H. K., Muntoni, F., Quattrone, A., Gillingwater T.H., Viero, G. 2017. In Vivo Translatome Profiling in Spinal Muscular Atrophy Reveals a Role for SMN Protein in Ribosome Biology. Cell reports, 21(4), 953-965. Clamer, M., Viero, G., Guella, G. and Quattrone, A., 2016. New molecules for isolation of polyribosomes, ribosomes, uses and kits thereof. Re, A., Waldron, L. and Quattrone, A., 2016. Control of gene expression by RNA binding protein action on alternative translation initiation sites. PLoS computational biology, 12(12), p.e1005198. Sun, W., Incitti, T., Migliaresi, C., Quattrone, A., Casarosa, S. and Motta, A., 2016. Genipin‐crosslinked gelatin–silk fibroin hydrogels for modulating the behaviour of pluripotent cells. Journal of tissue engineering and regenerative medicine, 10(10), pp.876-887. Quattrone, A. and Dassi, E., 2016. Introduction to bioinformatics resources for post-transcriptional regulation of gene expression. In Post-Transcriptional Gene Regulation (pp. 3-28). Humana Press, New York, NY. Dassi, E. and Quattrone, A., 2015. DynaMIT: the dynamic motif integration toolkit. Nucleic acids research, 44(1), pp.e2-e2. Nucleic Acids Res. (2015) pii: gkv781. Sidarovich V., Adami V., Gatto P., Greco V., Tebaldi T., Tonini GP., Quattrone A. "Translational downregulation of HSP90 expression by iron chelators in neuroblastoma cells." Mol Pharmacol. (2015) doi: 10.1124/mol.114.095729. Dassi E., Quattrone A. "Fingerprints of a message: integrating positional information on the transcriptome." Front Cell Dev Biol. 2014 Aug 14;2:39. doi: 10.3389/fcell.2014.00039. Sidarovich V., Adami V, Quattrone A. "A cell-based high-throughput screen addressing 3'UTR-dependent regulation of the MYCN gene." Mol Biotechnol. (2014) doi: 10.1007/s12033-014-9739-z. Tebaldi T, Dassi E, Kostoska G, Viero G, Quattrone A. 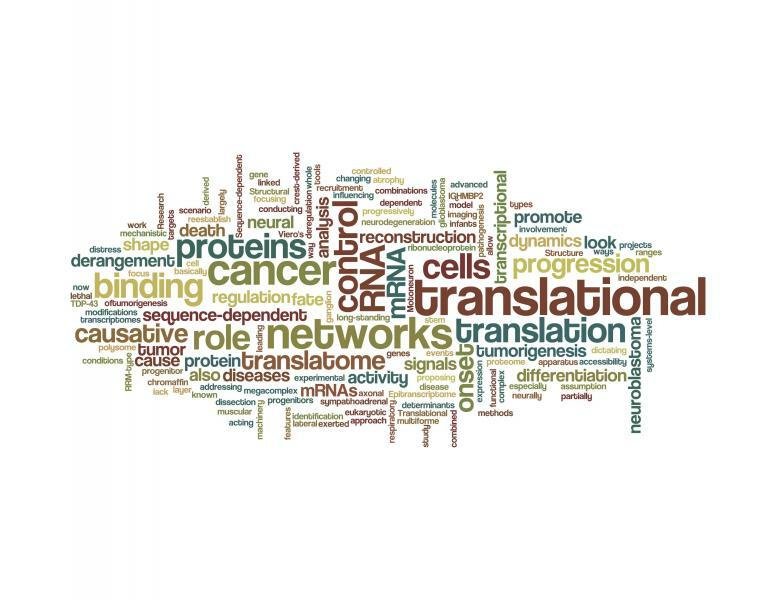 "tRanslatome: an R/Bioconductor package to portray translational control." Bioinformatics. 2014 Jan 15;30(2):289-91. doi: 10.1093/bioinformatics/btt634. Dassi E, Zuccotti P, Leo S, Provenzani A, Assfalg M, D'Onofrio M, Riva P, Quattrone A. "Hyper conserved elements in vertebrate mRNA 3'-UTRs reveal a translational network of RNA-binding proteins controlled by HuR." Nucleic Acids Res. (2013) doi: 10.1093/nar/gkt017.